Diclofenac sodium is a non steroidal anti - inflammatory drug that helps relieve pain, stiffness, and swelling caused by several types of arthritis, including osteoarthritis and rheumatoid arthritis. Thiocolchicoside (THC) is used clinically for its muscle relaxant, anti-inflammatory, and analgesic properties, and it has been shown to interact with g-amino butyric acid (GABA) type a receptors (GABAARs) and strychnine sensitive Glycine receptors in the rat central nervous system. It acts as a competitive GABAA receptor antagonist and also inhibits glycine receptors with similar potency and nicotinic acetylcholine receptors to a much lesser extent. It has powerful convulsant activity and should not be used in seizureprone individuals. Muscle Relaxant, Anti-Inflammatory, Analgesic and Anesthetic. Drugs that can potentially interfere with diclofenac sodium include diuretics, other nonsteroidal anti-inflammatory drugs, and some herbal supplements. These interactions may increase the risk of kidney damage, reduce the activity of diuretics, or make ACE inhibitors less effective, among other things. If diclofenac sodium drug interactions are a concern, your healthcare provider may adjust your dosage or monitor you more closely. ● In patients in whom substances with a similar action (e.g. aspirin, or other NSAIDs), precipitate attacks of asthma, bronchospasm, acute rhinitis or urticaria or patients are hypersensitive to these drugs. ● Severe heart failure or severely impaired hepatic or renal organ function and during the last three months of pregnancy. This is a new combination for a muscle relaxant and displays anti - inflammatory and analgesic properties. 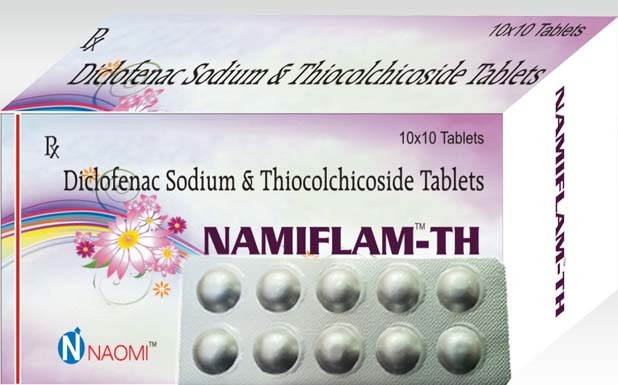 Thiocolchicoside & Diclofenac Sodium is well absorbed from the gastrointestinal tract. It shows its effect in 1 - 2 hr after oral administration. This combination is used to treat various painful inflammatory conditions. Diclofenac Sodium has an outstanding anti-inflammatory profile mediated primarily through inhibition of cyclooxygenase (COX) activity and suppression of PGE2 synthesis From the above discussion, it can be concluded that this medicine could improve the quality of life of patients with as well as muscle relaxant in addition. Moreover it has a considerable safety profile, with persistent results.